You guys seemed to be quite taken with the trio of duochrome polishes I blogged about last week, so when I was in London, I picked up three of the Miss Sporty Metal Flip Duochromes to give away. Ok, it’s not the most valuable competition I’ve ever held, but for those of you who can’t get your hands on these babies, well… it’s hopefully still enticing! Aren’t they pretty? They look like miniature galaxies swirling around the bottles! 3. 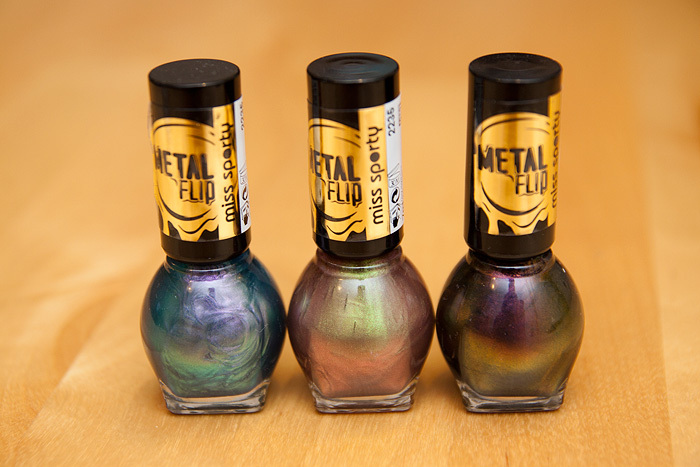 There is one prize to be won, a trio of Miss Sporty Metal Flip Duochrome Nail Polishes (worth £1.99 each). No cash alternatives. 6. Only one entry per email address will be accepted. 7. Personal details will not be kept or forwarded and are only used in the context of this competition to inform the winner(s) of their prize status. 8. Three winners will be selected at random from all entries received. 9. Winners will be notified within 5 working days and will be expected to reply to an email sent to the address used to enter the competition within 5 working days or risk forfeiting the prize. Oooh, these are gorgeous! Love a good duochrome! oooh, soo pretty!!! want want want!!! Oooh, yes please! I found Orly Space Cadet for $3 in a blog sale, but I’m going to nobly give it to my friend for Christmas. This would help ease the sting. Oooh, I don’t think I own any duochrome polishes! Awesome! I hope I’m lucky! So pretty!! Thanks for this giveaway! I love nail polish…they’re never enough!! I’d love to give these a whirl! I’ve been obsessed with these since you first posted about them! Thank you for the giveaway! I really like the look of duochrome polishes, but I haven’t actually tried any yet. Thank you for doing an awesome giveaway! I love duochromes!! We used to have Miss Sporty in my drugstore, but the discontinued it These look great! These are all stunning. Thank you for giving us the opportunity to win them :). Ohhhhh, they’re so pretty! I wonder if there’s any way to order these online. Why are all the best duochromes from a different country? Oh wow, thank you so much for including us international girls. I love the shades! I wish those were availble when I was in the UK this summer. I bought so many lovely nail varnishes. Oooh, I wish these were available in my country, that purple looks amazing! Nice giveaway , thank you ! I’d like to try one of these ! They look so lovely Charlotte! Genius giveaway! Love that you said they look like mini galaxies! amazing colours, ive never seen them before now!